This book is intended to serve as a reference for professionals in the medical device industry, in particular those seeking to learn from practical examples and case studies. Medical devices, like pharmaceuticals, are highly regulated and the bar is raised constantly as patients and consumers expect the best quality healthcare and safe and effective medical technologies. Obtaining marketing authorization is the first major hurdle that med techs need to overcome in their pursuit of commercial success. Most books on regulatory affairs present regulations in each jurisdiction separately: European Union, USA, Australia, Canada, and Japan. 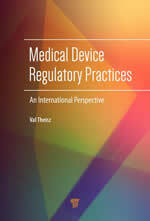 This book proposes practical solutions for a coherent, one-size-fits-all (or most) set of systems and processes in compliance with regulations in all key markets, throughout the life cycle of a medical device. It also contains key information about international harmonization efforts and recent regulatory trends in emerging markets; important terminology needed to understand the regulators’ language; and examples, case studies, and practical recommendations that bridge the gap between regulatory theory and practice. Reproduced with the kind permission of Global Regulatory Press, London from the Journal of Medical Device Regulation.